Unless you own a RAZR MAXX, chances are good that your phone's battery is going to die by the end of the day. So you can either gird yourself for another fun-filled bus ride staring out the window or you can get the one of Eton's three new Boost Turbine backup batteries. The BT 4000 is the follow on generation of last year's BT 2000, which we rather liked aside from the massive amounts of winding it required. Luckily the new iteration features more efficient gearing that translates a single minute of cranking into a full four minutes of battery life. And with a beefy 4000mAh lithium battery, this Boost Turbine will recharge your phone twice over. At 5 inches long, 2.2 inches wide, an inch thick and weighing 9 ounces, the aluminum clad battery pack should be able to fit in your pocket but is probably better off left in your computer bag given its weight. Like its predecessor, the BT4000 includes USB 2 and microUSB ports for charging mobile devices. If you'd prefer to forgo the emergency charging capabilities of the BT4000's crank handle in favor of a slimmer design, check out the BT 4200. It's got all the same power capacity specs as the 4000 but eliminates the handle to slim down to 5.1 x 2.5 x .4 inches. Or if you find yourself needing to charge both your phone and a friend's—you know, simultaneously—take a look at the BT 8400. As its name implies, this unit includes a 8000mAh Li-ion battery capable of recharging the average smartphone four times on a single charge and can concurrently charge two separate mobile devices, both at 5V 2.1 amps. 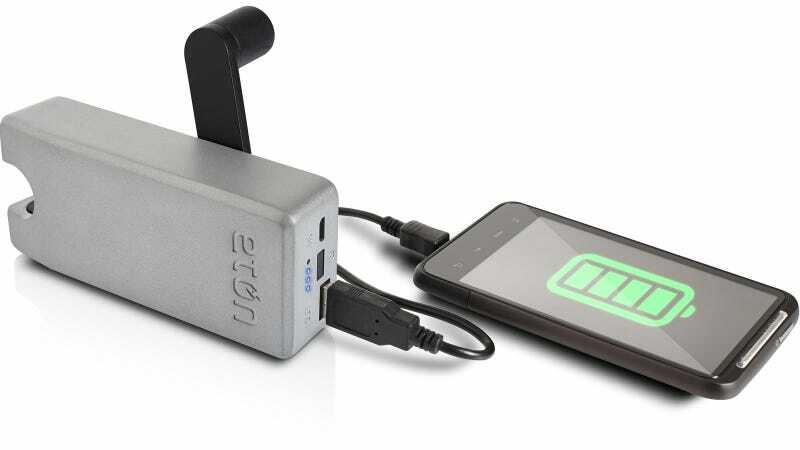 The 4000 reportedly takes about 4.5 hours to fully charge using a wall socket. The 4200 takes an even 5 hours and the 8000 will require an overnight 9-hour charge to reach capacity. The Boost Turbine 4000—the hand crank—will retail for $80, the slimline 4200 will cost $60, and the big daddy 8400 will set you back $100. That's a small price to pay for potentially quadrupling your battery supply.